Authority: Rabbi Mordechai Kaplinsky, Brooklyn NY, U.S.A. 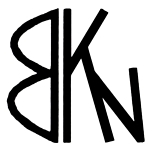 Comment: While BKN may be interpreted as an abbreviation of Brooklyn where the hechsher and its hashgacha are based, it is actually an abbreviation of three forenames within the Kaplinsky family. Binyamin for Rabbi Kaplinsky himself and Kornmel Nachum for Rabbi Kaplinsky's father who started the hashgacha.